These are suspension systems that offer driving comfort by reducing adverse effects caused by variable road conditions. 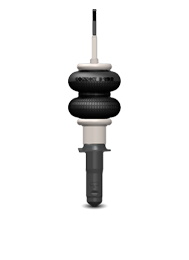 Air spring systems developed specifically for passenger cars minimize the changes on the vehicles center of mass and offer adjustable vehicle height to serve under various load conditions. Meklas began producing air springs in Bursa in 1986, and today, with over 30 years of experience, keeps producing air springs along with vibration absorbers for heavy vehicles and trailer manufacturers.